The pie charts below show the proportion of freshwater withdrawals made by various economy sectors in three countries in a given year. 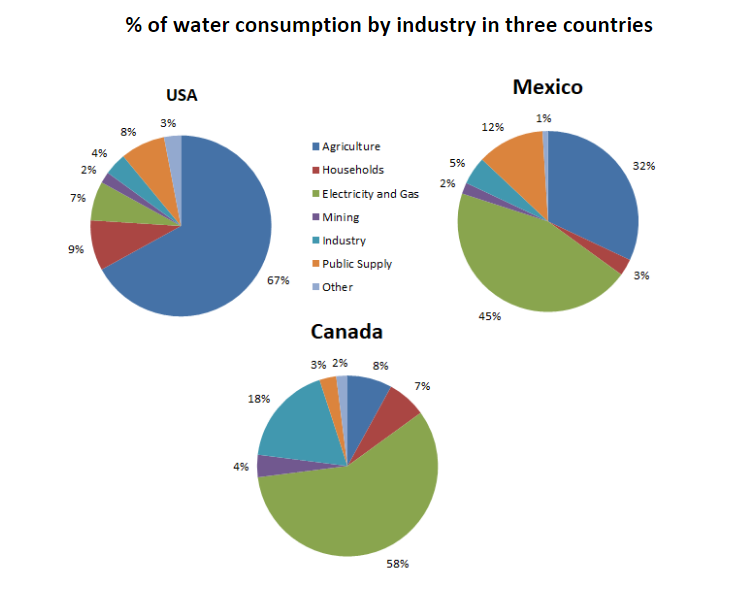 The pie charts illustrate how freshwater is withdrawn by seven industry sectors in three different countries, (the USA, Mexico, and Canada) over one year. Overall, agriculture was the primary user of fresh water in the USA, while the electricity and gas sector predominated in Canada and Mexico. Fresh water use then varied between each country with some similarities. In the USA, agriculture withdrew 67% of all fresh water followed by households (9%), public supply (8%), and electricity and gas at 7%. Remaining water users together comprised just 9% of total water consumption. In contrast to the USA, Mexico and Canada used water mainly for electricity and gas with the sector accounting for 45% and 58% respectively. In Mexico, agriculture made up the second largest water consumer at around a third, while public supply was the third largest user with 12% of the total. In Canada, however, after power generation, industry used almost a fifth (18%) of total freshwater followed by agriculture and households at 8% and 7%. Country names are given here alongside location, and both years. Describe the biggest freshwater users in each country as well as the least. There was no trend for fresh water usage after accounting for the biggest and smallest users. Describe the USA’s water consumption first. This paragraph contrasts Mexico and Canada with the USA. The first, second and third largest consumers of water in both these countries are compared. It is easy to see how this paragraph compares to the first body paragraph. The pie charts illustration how freshwater was withdrawn by seven industry sector in three different countries, (the USA, Mexico, and Canada) on one year. Overall, agriculture is primary user of fresh water in USA, while the electricity and gas sector predomination in Canada and Meksico. Fresh water using then vary between each country with some similarity. In USA, agriculture withdrew 67% of all fresh water followed households (9%), public supply (8%), and electricity and gas at 7%. Remain water users together comprise just 9% of total water consumption. In contrast to USA, Mexico and Canada used water main for electricity and gas with the sector accounting 45% and 58% respectively. In Mexico, agriculture made the second largest water consumer at around third, while public supply was the third largest user with 12% of the total. In Canada however after power generation, industry used almost a fifth (18%) of total freshwater followed by agriculture and household at 8% and 7%. Look the pie chart for the USA. What are the largest /smallest segments? Consider the other two pie charts. What are the largest/smallest segments for those? Are there any similarities or contrasts with the USA?